Kick Shot Pool grabs you with its beautiful graphics and intuitive controls, then refuses to let go of you with its addictive gameplay and wide range of human and CPU opponents. Easy to learn but tricky to master - Fun for the whole family! 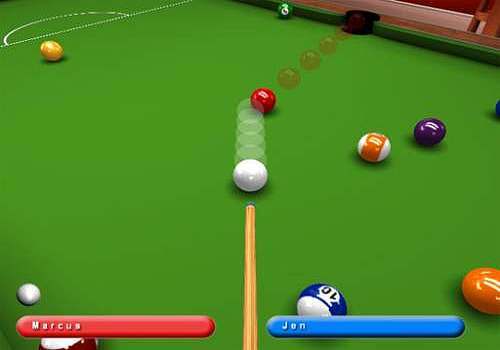 Fun physics offer the perfect combination of realism and entertainment for a truly satisfying game of pool. Play against your friends and family, a range of CPU opponents to match all skill levels, or use our Online Gaming Service to find players from all over the world for a neverending challenge. Beautiful 3d graphics and silky smooth performance on even low spec computers. Small download ensures that even dialup connections can be playing this game in no time. Safe, secure ordering from a well known and trusted source. A beautiful three-dimensional billiard simulation. You can play alone to train, against other players or against the computer. The software offers different views of the table, as well as precise settings to control the cue as well as possible. A great achievement.